The use of mobile technologies in Clinical Trials present many opportunities to further improve how research is conducted. Some areas, such as ePRO, have seen steady adoption in clinical trials over the past 5 years, but it’s adoption for use in other tools has lagged. 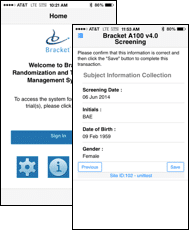 In 2014, Bracket released the first native mobile application design to enable the randomization of trial subjects from a users smartphone. On Monday, October 26, Yet Mui from Bracket and Cecilia Tran-Muchowski from Gilead will present a case study with results and observations from a program that utilized this approach. “The Movement of IRT to Web and Smartphone-Based Interfaces” will be presented as part of the 5th Annual Interactive Response Technologies in Clinical Trials Forum in Philadelphia, PA. The talk will address how the technology is being adopted, how the mobile app can reduce dispensation errors, and describe the integrated barcode scanning that is a key component when implementing mobile IRT.